Don’t you feel lucky to have a job that makes people happy? You do something which evokes smiles, and if you’ve done a really good job, tears of joy. Now imagine spreading those emotions beyond your client base and sharing them with a huge audience. We have a skill that can be used for the greater good and is desperately needed. We can give back! Partnering with a charity or non-profit allows you as a photographer to build relationships with folks outside your existing client base, be exposed to new ideas, and work toward a common goal. Creatively, you may be able to use techniques that are not practical in your day-to-day work, giving you the chance to make images that challenge you as an artist. Finally, sharing your volunteer experience (if permitted by the charity) is a wonderful way to engage with your existing client base. A blog post or picture on social media about your experience working on a charity project is a great talking point. Tread carefully. Since you are not giving away the same services and products that you sell to your customers, such as a portrait sitting and an 8×10 print, it is easy to draw a distinction. You are not “working for free” in the same way that you would with a client. You are using your technical and artistic skills to make a meaningful contribution to a charity, in the same way that most lawyers undertake pro bono work. Most photographers find that it is an honor to fulfill this role, not a burden. Nonetheless, it is important to clearly communicate what you can deliver by putting the necessary licensing and copyright contracts in place so that the charity may use your images with the understanding that you are the ultimate copyright holder. Every town has a 5k race at some point during the year, with the proceeds going to a good cause, usually also local. These events are a light-hearted, fun way to get involved in your community and share your talent for capturing people. Contact the organizers in advance to offer your services and ask for advice on the route. Before race day, be sure to scope out the best places to stand for the beginning, middle and end of the race — not forgetting the celebrations that usually follow a fun run! 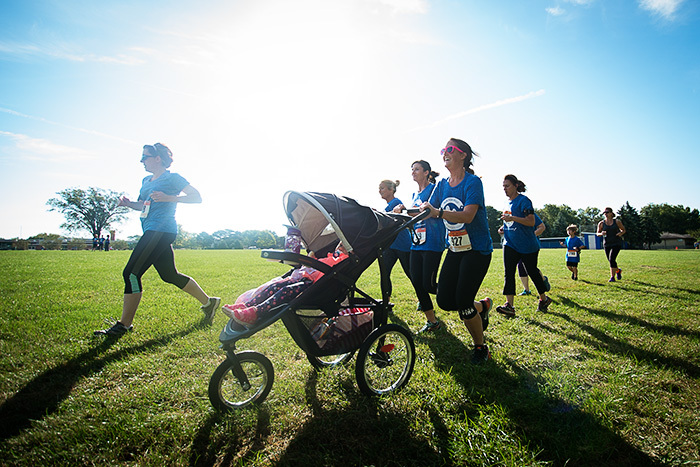 A 5k usually only lasts for a couple hours and is held early in the day, making it the perfect way to give your time efficiently. 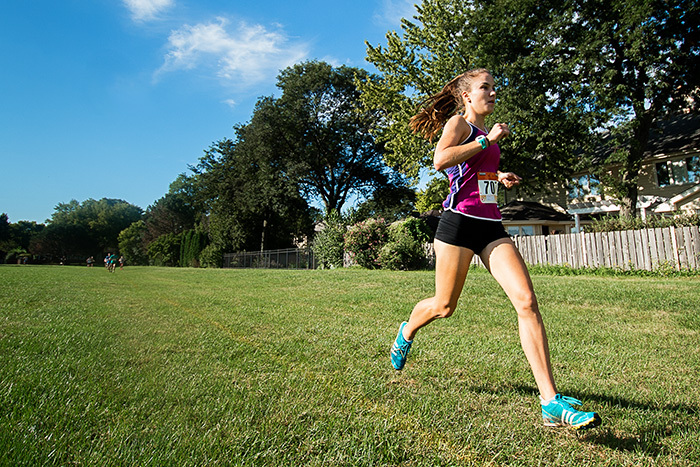 Since races are held outside, natural light photographers feel at ease capturing the action and excitement of the event. The race organizers will be thrilled when they see the high quality images you deliver (way better than Uncle Joe’s iPhone pictures!) ready to use in follow-up marketing and to promote the event the following year! As a side note, don’t turn this into a business opportunity. It is not recommended that you sell images to the race participants themselves through an online gallery system. It’s too complicated and sends the wrong message. Focus on building a great relationship with the organizers and let the positive mojo “run its course” by spreading through your community organically. 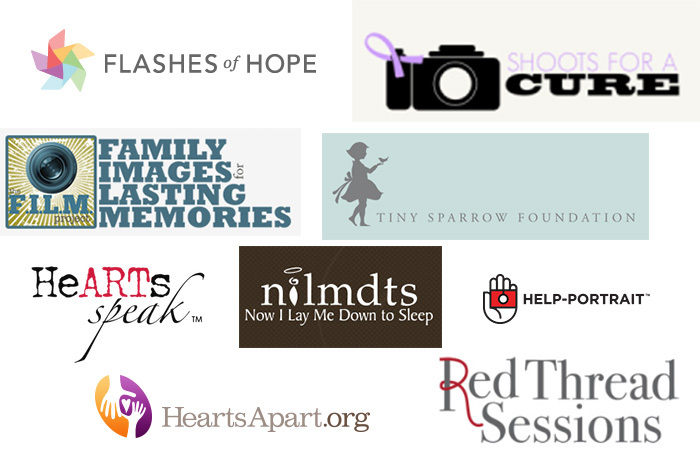 These organizations, plus many more, have an infrastructure already in place to connect portrait photographers to families in need of images. Photographers capture a child or family at a difficult or transitional time of life. Each organization has a specific focus, from infant bereavement to childhood cancer. Photographers should research which organization would be the best fit for their abilities and interests, then follow the guidelines for registering. You may be required to submit a background check, portfolio review, training session or written application. One big pro of working with an established portrait charity is that they will handle all the documentation and legwork. A downside is that you may have to be flexible about when you can shoot your assigned sessions. Check out Shutter Mission for a full list of charities. If you want to dip your toe into the charity sector for the first time, try to keep it simple and stay close to home. Short travel times, great relationship-building opportunities and the chance to see the impact of your work make this a good first step. The most gratifying form of giving is when you connect with a charity or non-profit organization through a long term project. In this scenario, you will be working as part of a team within the organization as if you were paid contractor, providing them with images that fulfill a creative brief. Passion projects can be in any sector, so long as you feel strongly about the images you are providing — it could be documenting the homeless, working with a pet shelter, attending outreach projects, or capturing fundraising events. A passion project allows you to use creative techniques that may not be appropriate in your day-to-day business, challenging you creatively and helping you grow as an artist. Since your relationship with a charity will be quite involved, be sure that you are able to commit to your chosen cause whole-heartedly. It is important to have open communication and clarity from the beginning about how much time you can set aside for this type of project. Furthermore, you should treat the charity as if it were a paying client, delivering the finest quality images by an agreed deadline. Your imagery will likely shape the look and feel of the charity’s communications – an incredibly rewarding feeling. Do you want to support a specific cause but find that it’s not feasible to give your photography services directly to that charity? No problem! Host a special event and give the proceeds instead. 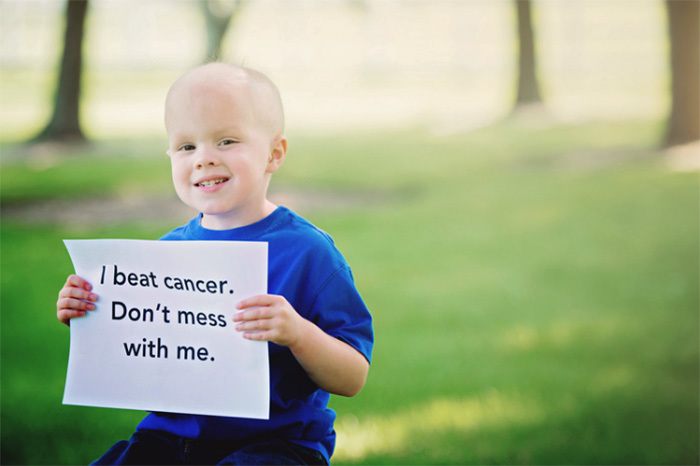 This is an ideal way to raise awareness about something important to you while making a tangible difference. Offer a day dedicated to short sessions from which you will give a portion of the proceeds to your selected charity. For example, a day of children’s mini sessions, Halloween or springtime portraits, business head shots, or mini family packages. Market these to your clients as charity-supporting sessions so that they feel the good vibes too! If possible, contact your chosen charity in advance to get permission to use their logo in your marketing materials and learn of any branding guidelines that may be necessary. In this scenario, it could be possible to claim your monetary donation as tax-deductible, making it win-win. Ask your tax professional for further advice. 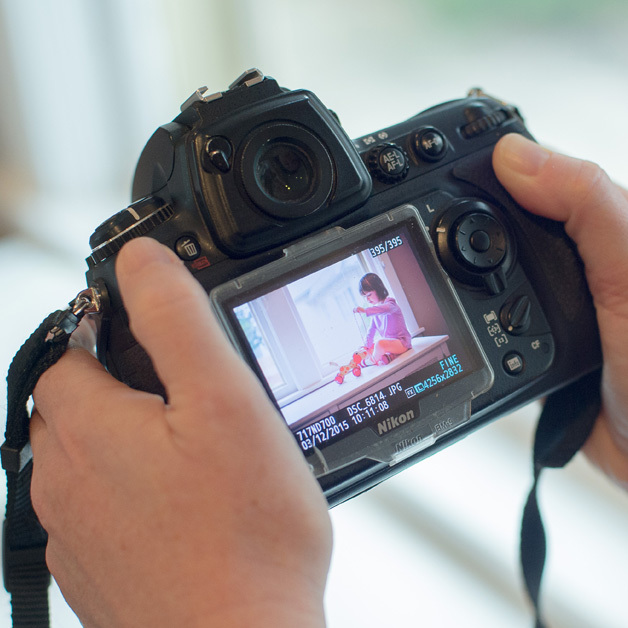 As a children’s portrait photographer, you are a prime candidate to be asked to donate to an event auction. It can be tricky to navigate this request since it often comes from a client who you do not want to disappoint. In addition to wanting to connect you to their favorite cause, the client may also feel like they are offering you exposure to a valuable market, though this is not the always the case. 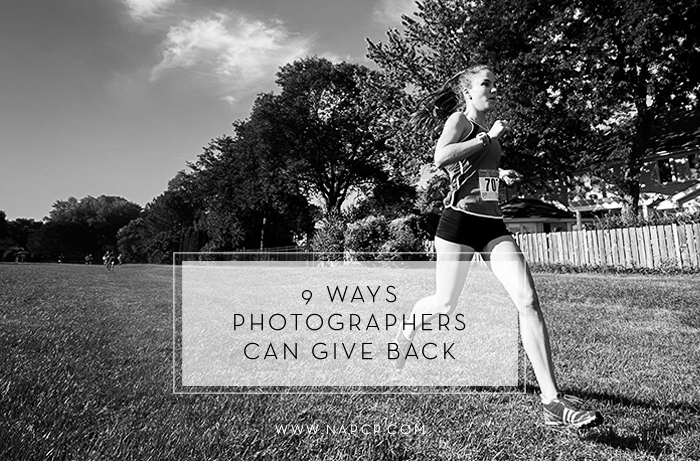 It’s easy to appease the client by saying “Sure, I’ll donate a mini session and a print credit for an 8×10”, but by following this approach you may be doing yourself, the charity and the client a disservice. Rather than saying yes to every event, try giving just once or twice a year but “go large”. Give in a big way to local high-end charities that attract your target market. 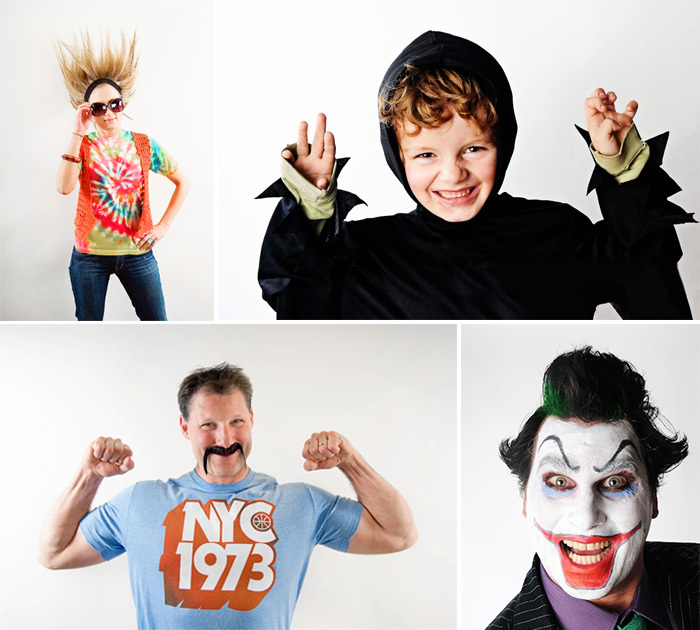 Make a splash by donating a full session plus a large canvas (or $300+ print credit). If the auction is a live event, arrange to have some of your best pieces on display to demonstrate the high value of your services. Be sure to tell the organizer the total value of your donation, including the session fee, so that bidders understand the value of your work and you do not attract bargain hunters. In turn, your donation is likely to attract higher bids from bidders who value your work. After donating your sessions to one or two events, it’s easier to turn down subsequent requests with honesty and integrity by saying you have already reached your quota financially for this year. Do you have school-aged kids? Yes? Congratulations, you have a built-in route for donating your services! You may not have the temper to be on school committees or the time to oversee school events, but ask a photographer to show up with a camera and we are there! I’ve built up a rapport with the school principal over the years and she now uses me as her go to for public-facing photography requests. Working with your child’s school is gratifying and has the added benefit of directly supporting your kids. Since most schools are run under a set budget and are not technically a charity you may wonder how you can make a difference? It’s the rising tide idea … “A rising tide lifts all boats.” Taking pictures at school events gives the school a way to reach out to community through local papers, enhances the yearbook program, adds fresh artwork to the hallways, offers better imagery for the school website and builds team spirit among children and teachers. Sometimes it’s best for a charity to help themselves. Most marketing managers need a constant stream of imagery for their campaigns and social media presence, much of which they could photograph themselves, if they only knew how! Reach out to your friends who work in the not-for-profit/charity sector and offer to share your tips and tricks in a half-day mentoring session. Better yet, connect with a consultant that provides these services to groups of charities and offer to teach a whole class. Topics you could cover include: how to use a flash indoors, changing angles to tell a story, making artistic shots with an iPhone, shooting details to represent an idea, and standing back to get the big picture. As you embark on a journey of giving, its most important that you do so with an open heart. 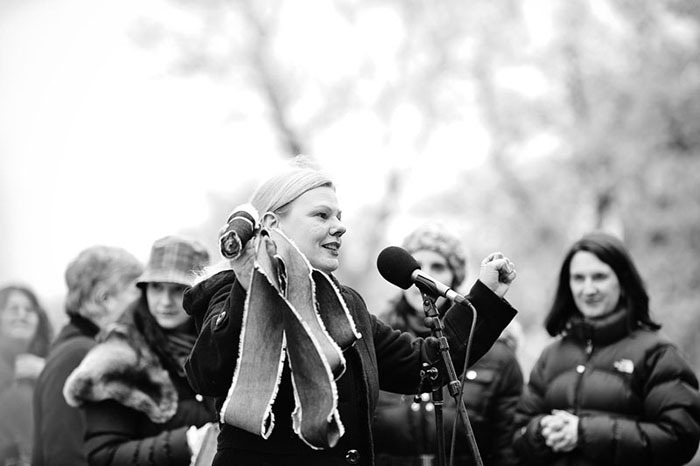 Find a cause that resonates with you and fits with your schedule, budget and personal values. When your contribution is made purposefully it will feel like a privilege. * Henderson, A. T., and Berla, N. (1994). 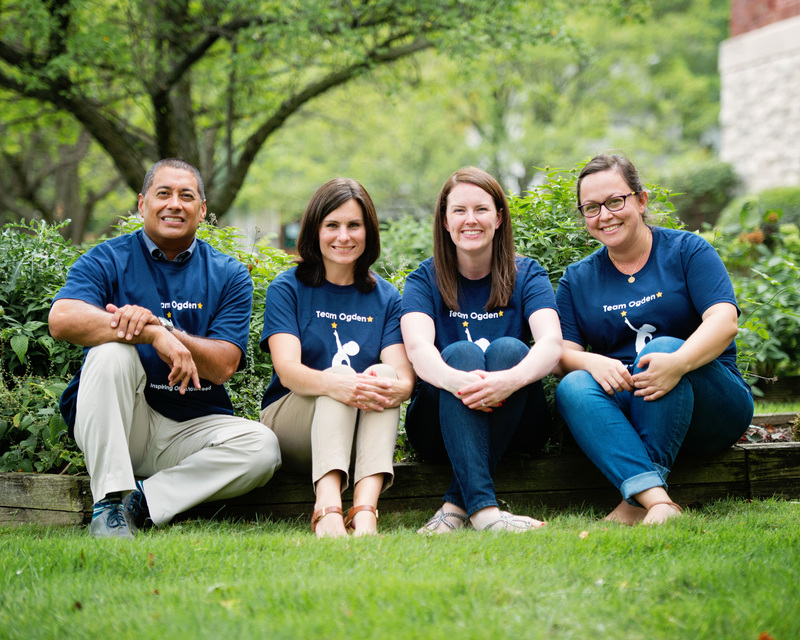 A new generation of evidence: The family is critical to student achievement. Washington, DC: National Committee for Citizens in Education. 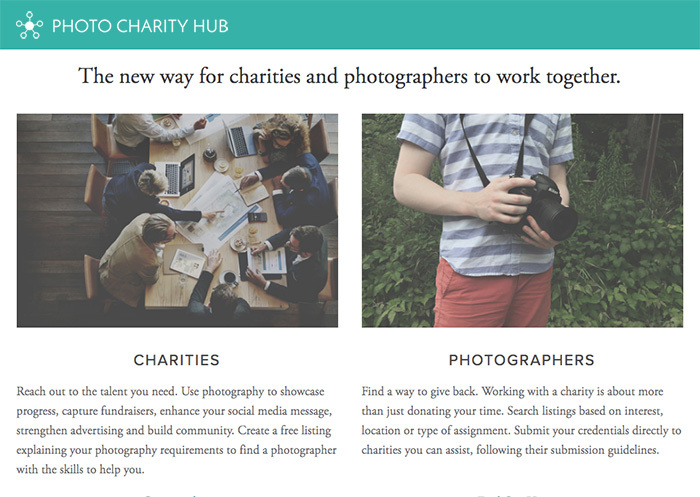 *** Disclaimer: Heidi Peters, the author of this article, created Photo Charity Hub. What a great post! As the Austin-area coordinator for Now I Lay Me Down To Sleep, I do a lot of outreach to our area photographers. So many times, I’ve heard “if I only knew about you” from photographers that want to give back, but can’t find a good starting place. Marketing Summit 2018: You're Invited!